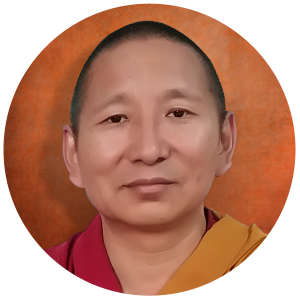 Geshe Lobsang Choephel was born in north India (simla) in 1974 and entered Sera-May Monastery at an early age. As part of his Dharma study, Geshe Lobsang Choephel studied and completed many great textbooks, including Paramita (perfection of wisdom), Madhyamika (middle view), Pramana (valid cognition), Vinaya (moral discipline) and Abidharma (treasure of knowledge) in 2007 he awarded degree of Lharampa Geshe Title (Ph.D.degree in Buddhist Philosophy) from Sera May monastic University. In 2008 he completed the post-doctoral studies in Tantric Buddhists Philosophy at Gyumed Tantric University. In 2011 he was appointed as member of Jang-Gunchoe committee for five years. Geshe Thupten Kunsang (Executive Director, Ananda Dharma Center) was ordained at the age of 10 at Sera Jey Monastery in 1976. He received his Getsul vows from Venerable Ling Rinpoche in 1977, and in 1998 he received full ordination (Gelong) from His Holiness the Dalai Lama. 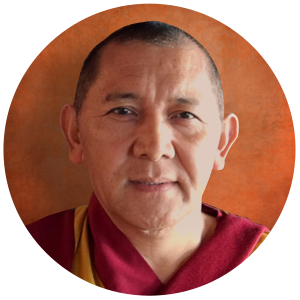 Geshe Kunsang completed over 18 years of study, including The Five Great Treatises of Buddhism, and he received his Geshe Degree (equivalent to a PhD in Buddhist Philosophy & Practice) in 2001. After receiving his Geshe Degree, Geshela served as an administrator of Sera Lhachi Thechenling for 3 years before becoming attendant to H.E. Choden Rinpoche from 2007 to 2009. Geshela also served as the Chief Administrator of Sera Je Lhopa Khangtsen from 2008 to 2014. Geshela is very kind and easy going. He is also experienced in the management of Dharma organizations, and we are very fortunate that Geshela is the Executive Director of Ananda Dharma Center. Shabdrung Rinpoche was born on 9th September 1976 to a small nomadic family in Ladakh, Northern Himalayan region. In 1988, His Holiness the 14th Dalai Lama recognized him as the reincarnation of the 11th Shangshung Choewang Dakpa, one of the greatest disciples of Lama Je Tsongkhapa, the founder of Gelugpa Tradition. In that same year, he was enrolled in Sera Monastery and Venerable Kyabje Choenden Rinpoche laid the basic foundation and gave his unwavering support for acquiring the in-depth knowledge of Buddhist Philosophy and practice. In same year, I was blessed to ordain the vows of probationer (Sramanerah) from His Holiness the Dalai Lama. Currently, he is spending most of his time in mediation; receiving various commentaries, Empowerments and oral transmissions of Sutrayana and Tantrayana from His Holiness the Dalai Lama and other learned Buddhist teachers. Venerable Gyalten Tsondue (also known affectionately as Jampa-la) was born in Tibet and eventually came to India. Always wanting to be a monk, he was ordained in 1994, receiving his novice vows from H.E. Choden Rinpoche. From 1994 to 2013 Ven. 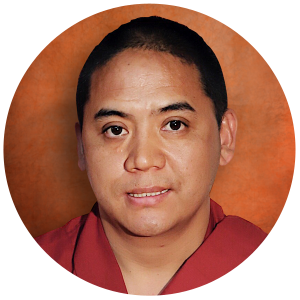 Tsondue was a resident monk at Sera Jey Monastery in India, pursuing Buddhist education. On February 23, 2009 he received his full ordination vows from H.H. the Dalai Lama. 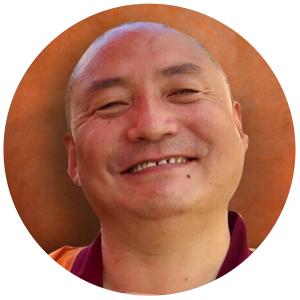 After nearly 20 years of study, Choden Rinpoche chose Ven. Tsondue to be one of the resident teachers at Ananda Dharma Center. When Ven. Tsondue came to the United States as part of Rinpoche’s entourage, Rinpoche gave a beautiful introduction of Ven. 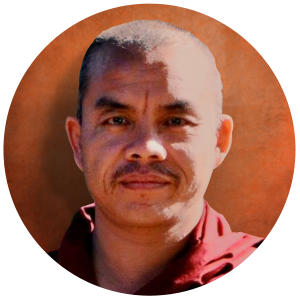 Tsondue and advised that he is a fully qualified dharma teacher whose understanding of dharma knowledge is penetrative and vast. Ven. Tsondue is also highly knowledgeable about the symbolism and use of dharma instruments and conducting rituals. Geshe Yeshe Lhundup was born in Lhasa, Tibet in1966. Before coming to India he had over three years schooling in Lhasa and learned Tibetan script reading and writing. In 1975, he joined Drepung Loseling monastery in south India and studied Buddhadharma, mainly Five Major Subjects until 1996 and took serial exams at Loseling Monastery securing first position. Through the guidance and relentless compassionate instructions of many great masters such as Khensur Yeshe Thupten, he obtained Geshe Lharampa degree in1996. After this he joined Gyutoe Tantric Monastery continuing his pursuit of tantric study and practice. In 2005 he took tantric exams and ranked in first division. In 2006 he sat for formal tantric answering session (Sangngag Dhamcha) at Gyuto Monastery. On the year of 2011, I assumed the responsibility as the chief disciplinarian of Gyuto Tantric Monastery, completed the tenure at the same year. During my spiritual pursuit I have great opportunity receiving teachings from the tutor to HH the Dalai Lama, Kyabje Ling Rinpoche and Kyabje Trijang Rinpoche as well and of course from HH the Dalai Lama himself. I have been teaching Buddha dharma at Drepung Loseling Monastery for more then 16 years since I received Geshe Lharampa degree. At present I serve as the spiritual director of (Labsumpendheling) main meditation center at Drepung Monastery south India. Several times in the past I went to USA as a visiting scholar for dharma centers there. Geshe Lobsang Jhampa (Resident Teacher Taiwan Centers) Venerable Geshe Lobsang Jampa, son of Mr. Tashi Lhundup nd Mrs. Nordon was born on 5th October, 1970. In 1982, he became a monk under blessing by Choegye Khen Rinpoche, from the year itself; he learnt chanting in Palden Ganggon Jamchen Choeling. In 1988, he was enrolled in Sera Jey Monastery after seeing Khen Rinpoche Lobsang Tsering. In 1989, he took the Getsul (novice monk) vow from Gaden Tripa Lobsang Nyima. In 1990, he received the precious opportunity to take Gelong (Bhikshu) vow from His Holiness the Fourteen Dalai Lama. 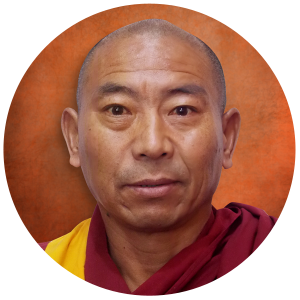 Geshe Jhampa studied from basic Buddhist philosophy in Sera Je Monastery, and after completing every level in the monastery, he taught Buddhist philosophy to his students. In 2005, he appeared for Gelug Examination, and in 2010, for a year, he had been a Buddhist philosophy teacher in his monastery. On 18th October, 2010, he successfully presented his Geshe Lharampa thesis for the great Gelug Examination in Sera Jey Monastery with first division. Again, on 12th March 2011, he successfully presented his thesis for the Geshe Lharampa examination during the Monlam Chenmo in front of three great Gelugpa monasteries with first division. In 2012, along with teaching Buddhist Philosophy in Guto Monastery, he studied tantra, and completed it with first division. In 2013, as per Khenrinpe Lobsang Delek’s wishes, he was assigned to teach Buddhist Philosophy at Geden Choeling Nunnery, and he taught four hours a day. In 2015, as per Rinpoche Lobsang Gyalten Jigdel Wangchuk Palsangpo ‘s wishes, he is sent to continue the teaching at Buddhist Centres in Taiwan called Thoesam Norling and Shedup Phelgyeling. 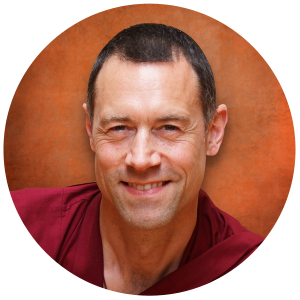 Venerable Gyalten Senge (Founder and Director, Awakening Vajra New Zealand) was born in Brighton, England in 1973. Zac was first to exposed to Buddhism at 21 years of age and resonated deeply with the Dharma. Zac has long been interested in eastern religion and philosophy and the correlation between science, philosophy and spirituality. His life path was transformed beyond words, when he met his Eminence Choden Rinpoche in 2007. In Rinpoche he found the teacher and guru that he had been looking for, the true embodiment of Love and Compassion and was overjoyed to have had the opportunity to take “novice” ordination with him before his transition in September 2015. It is a dream come true to be working alongside Geshe Gyalten, in helping to see Rinpoche’s vision manifest. Zac aspires to create a network of centers that support personal development and growth thus creating connection all levels, both Individually and Collectively. His vision is to create a center for healing that encompasses the teaching of the Buddha, whilst embracing ways of living and being that support the growth of love, compassion and wisdom within the community. The vision encompasses a holistic approach to wellness combining Meditation, Study, Creativity and Complimentary Healing. He is particularly interested in bringing down the boundaries between different traditions and religions, opening dialogue, and raising the consciousness of the planet.